How much does it cost to travel to Rotorua? How much money will you need in Rotorua? NZ$124 ($83) is the average daily price for traveling in Rotorua. The average price of food for one day is NZ$36 ($24). The average price of a hotel for a couple is NZ$131 ($87). Additional pricing is in the table below. These average travel prices have been collected from other travelers to help you plan your own travel budget. How much money do I need for Rotorua? Located on the banks of Lake Rotorua, Rotorua is famous as the thermal wonderland of New Zealand. The area has a variety of geothermal sights, but it is also close to several lakes and has more traditional activities as well, including fishing, boating and white water rafting. Rotorua is located in the Taupo Volcanic Zone, which is the largest volcano in the area. There are four major volcanic calderas that now have lakes, and several other volcanoes in the area. Rotorua sits on top of a thermal hot spring, and there are many vents and hot pools throughout the area. Many of the hot pools and sights are located within parks, with some of the best being Waimangu Volcanic Valley, Rainbow Springs Nature Park, and Wai-O-Tapu Thermal Wonderland. Rotorua has a warm, temperate climate. Because of the area's inland location, it has less wind than many places in New Zealand. Temperatures during the winter months can fall to below freezing, but snow is incredibly rare. Many of the sights in Rotorua do cost money, so you can expect to spend a decent amount on entertainment here. Parks and attractions with paid admission include Waimangu Volcanic Valley, Te Puia, Whakarewarewa Thermal Village, Skyline Skyrides, Rainbow Springs Nature Park, the Agrodome, the Buried Village, and Wai-oTapu Thermal Wonderland. Waimangu Volcanic Valley is the world's newest geothermal ecosystem, created by a massive 1886 eruption of Mt Tarawera. Te Puai has many bubbling mud pools and geysers as well as Maori cultural experiences. Whakarewarewa Thermal Village is comparable to Te Puia. For free attractions, you can visit the Government Gardens, Hamurana Springs, The Lakes, Motutara (Sulphur Bay), Okere Falls, Whakarewarewa Forest, and Rotorua Walkway. Rotorua has many suburbs, 17 lakes in the region, and countless parks where visitors can experience the thermal hot springs. Notable parks include the Buried Village (Te Wairoa) and Kuiraua Park. There is a particularly strong sulphur smell in the central-east "Te Ngae" area. This is because of the dense sulphur deposits next to the southern boundary of the Government Gardens in an area known as "Sulphur Point". As this is New Zealand, there is no shortage of adventure sports and activities in the area. You can enjoy activities such as land-sledding down Mt Ngongotaha, heli-touring, hiking through the thermal vents, zorbing, indoor rock climbing, whitewater rafting and sledging. It's also possible to play golf around the mud pools. There is a public golf course where you can play nine holes for about $10. Other activities in the area include visiting a Polynesian Spa, going to the Bibleworld Museum & Discovery Centre, going to the Lake Rotoiti Hot Pools, and taking guided bike tours of the area. Read this article for even more things to do in Rotorua. Rotorua is an excellent location to try a traditional Maori feast, referred to as the Hangi. There are venues throughout the area that offer you the opportunity to enjoy the feast, which is comparable in cooking style to a Hawaiian Umu. There's an earthen oven which is used to cook the dishes, giving them a very distinctive smokey flavor. If you're looking for something quicker and cheaper, you'll find some cafes around the area where you can pick up a sandwich or burger. Full scale restaurants are less common but you will find some attached to hotels in the area. Your best option is always to ask a local what they recommend. 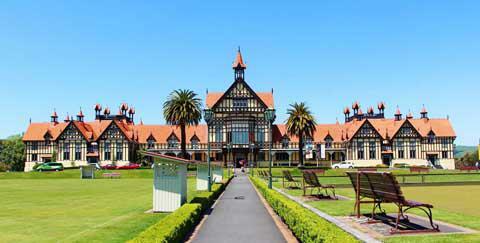 Rotorua is a convenient three hour drive south of Auckland. There is a small airport and a bus service that travels from various locations on the North Island, but once you arrive in the area, it really is essential that you have a car. If that isn't an option for you, then there is a limited bus service called CityRide. The buses are lime green and the main bus stop is on Pukuatua Street across from the ASB Bank. There are several routes that run across town and you can reach the Skyline, Rainbow Springs and Agrodome attractions by bus. You can expect to pay about $2.30 for the ride. It is important to remember that the buses stop running at 6:00 every night. Another option is a circuit bus that is run by GreatSights New Zealand, which is a national sightseeing operator. This route allows you to visit several sights including Te Puia, Rainbow Springs Nature Park, and the Agrodome.